You've probably heard of the Stanley Hotel. This century-old landmark in Estes Park, Colorado is the spooky spot that inspired Stephen King to write The Shining after he and his wife stayed there*. 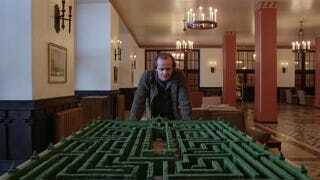 Now, you can design a giant hedge maze—inspired by the giant hedge maze in The Shining—on the Stanley Hotel grounds. The deadline is midnight on January 31. The prize? You get your "name placed on a recognition placard in the center of the maze." * Stanley Kubrick didn't actually film The Shining at the Stanley Hotel, though. The exterior shots were taken at the palatial Timberline Lodge in Oregon. Funnily enough, the fancy hotel from Dumb and Dumber were actually filmed at the Stanley Hotel.